When Ferdinand Magellan arrived more than 400 years ago, he came, not bearing coffers of goods for commerce and barter, but wielding and brandishing icons of Christianity - images of the Lady, the Child Jesus, and a crucifix. The natives so embraced the pageantry and the promise of the new faith, and centuries later, testament to that Christian hegemony is the ubiquity of an iconolatry, none as dispersed into the bowels of urban and rural religious life as the icon of the Santo Nino. The Child Jesus icon graces jeepney dashboards, the countless nooks and crannies of homes and commercial establishments, big and small, the grand altars of churches, and countless towns and barangays for their daily devotion and protectionand their cultist festivities and rituals. It is celebrated in countless festivals and processions, borne in floats, clasped in penitent embrace, or raise high above the din of dancing and bacchanalia. 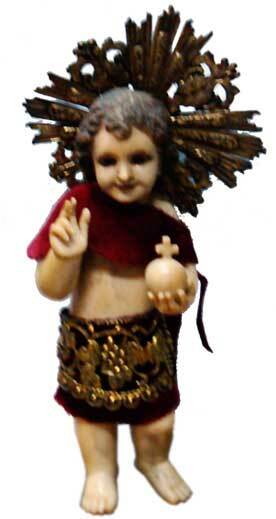 The icon of the Santo Nino is often used in the alternative liturgies of healers, passing the image over the body or rubbing it on ailing body parts in the background of familiar cathechismal prayers or the esoteria of bulongs and orasyons.